For a brief, terrifying moment, Keith Bunin thought his first stab at musical theater would be very short indeed. The 35-year-old playwright had for months been writing a show featuring songs by singer Patty Griffin. One big problem: He didn't really have her permission. So about three years ago, he invited Griffin, who lives in Austin, Texas, to come to New York and watch a rough version of the show, "10 Million Miles." Griffin, whose songs have been covered by the Dixie Chicks and Reba McEntire, was 45 minutes late, heightening the tension. Bunin and producers were pacing outside. "She was terrified and we were terrified," recalls Bunin. "I wrote a book to a show that I didn't have the rights to, essentially." Griffin, 43, eventually arrived, along with her manager and a close friend, and the three took their seats. When it was over, Bunin looked over at them and felt a new wave of terror: Tears were forming in Griffin's eyes. "They were all crying at the end - all three of them. So I felt complete panic," says Bunin. "She was very quiet - understandably." Not to worry - Bunin soon learned the tears were of affection, not anger. After leaving, Griffin called Bunin from the airport to give him the official thumbs-up. In a separate interview, the two-time Grammy nominee is asked if she ever considered her thoughtful, highly personal songs could be turned into a musical. "No, not in a million years," she replies. Nevertheless, their unusual collaboration has birthed "10 Million Miles," which debuts this month at the Atlantic Theater Company, where the 2007 Tony Award musical "Spring Awakening" also got its start. Starring Matthew Morrison and Irene Molloy, the new musical tells the story of a young couple whose relationship is tested during a road trip from Florida to New York in an old Chevy pickup. Bunin had been carrying around the story for a long time, thinking it could make a great screenplay. But while listening to Griffin's music, he began considering it as a musical. So he began a courtship, sending her a copy of his off-Broadway play "The Credeaux Canvas" as a sort of business card. He also met her backstage after a concert. When it became clear that Griffin couldn't devote the time for a full collaboration, she did the next best thing: She offered to supply a few new songs, tweak a few more, and allowed Bunin to rummage about in her archive of published and nonpublished work. "I almost feel like this is Keith's baby and he's asked to use this music to fit some sort of vision that he has and I was happy to supply it," she says. "It's like I made the window dressing or something." The two e-mailed constantly and exchanged CDs. They resisted the easy route of stocking the soundtrack with Griffin's more famous songs, such as "Rain" or "Top of the World." "It's hard to imagine trying to force a favorite song in," says Michael Mayer, who helmed "10 Million Miles" and just won a Tony for directing "Spring Awakening." "In that sense, this show is the opposite of a conventional, jukebox musical: It was more about finding the songs that actually worked with the story." Sometimes that wasn't enough. Halfway through the show, Griffin's song, "Forgiveness," simply wasn't working. It didn't move the story forward and wasn't in the voice of the characters. Bunin contacted Griffin. "I said, 'OK, here's what the characters are going through.' She said to me, 'What time of day is it? Where are they?' I said, 'Well, they have to be somewhere between Baltimore and Atlantic City,"' Bunin recalls. "She said, 'Can they be looking on the Chesapeake Bay?' I said, 'That's a fantastic idea!' So she wrote a whole song about looking out on the Chesapeake Bay, which is now one of our favorite songs." Bunin and Mayer say there's something unique about Griffin's songs that lend them to theater: She's a storyteller who often writes from the point of view of a character _ male or female. "It's emotional stuff and I think that does translate really well to what Keith is trying to pull off," says Griffin. "That was a discovery for me. I wrote these songs - I've known them for years, some ofthem _ and they presented them to me with a whole other understanding." 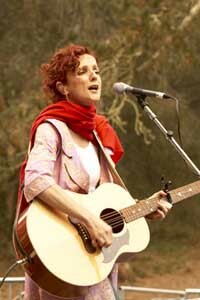 Griffin says the experience even helped her as a singer-songwriter. Her fifth studio album, "Children Running Through," was released earlier this year to some of the best reviews of her career. Along the way, Griffin became something of a musical theater convert. Previously, her only connection to Broadway was listening to her parents' "Man of La Mancha" album. "I'm not completely unfamiliar with Broadway music, but I have a much stronger appreciation of it now that I've seen people who actually are really, really good at it performing it," she says. "I realized, 'Wow, this would be fun to do from start to finish at some point.' I wish that I had known more about that part of myself about five years ago." Now that their unusual musical is finished, would Bunin ever consider diving into another long-distance collaboration with a songwriter? "It's been maybe an unusual process, but it seemed weirdly organic to this particular thing," says Bunin. "I wouldn't necessarily approach anything else the same way."